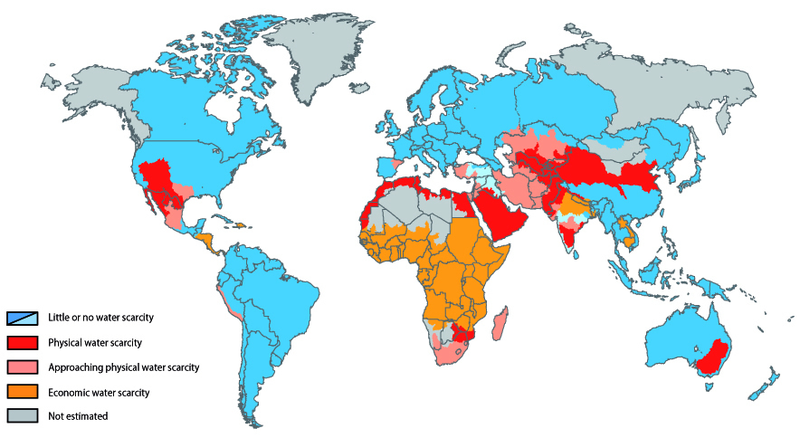 Water scarcity is a lack of drinkable water available in a given area. The lack of sufficient available water resources to meet the demands of water usage within a region. Water scarcity already affects every continent and around 2.8 billion people around the world at least one month out of every year. More than 1.2 billion people lack access to clean drinking water. It mostly affects arid and deserted areas, and places where the water is too polluted to drink. It is a social, environmental and economic problem in many countries. Water scarcity can be the result of both human and natural causes. Changes in climate and weather patterns can cause the availability of water to drop. Common human causes include over-consumption, bad governance, pollution, and increases in the demand for water.